We anticipate releasing a new version of our book over the coming months. Sorry for any inconvenience caused. SOLD OUT - Previous sales will be honoured. 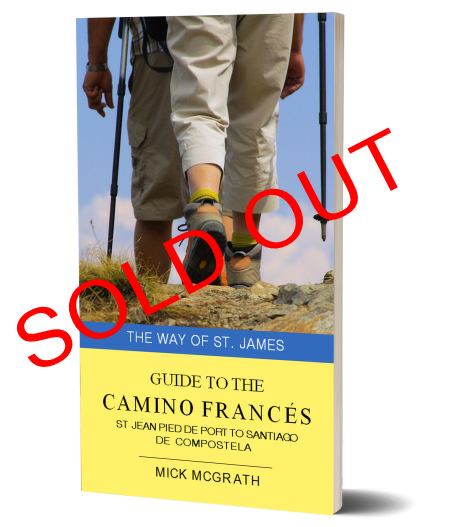 The Guide to the Camino Francés Second Edition is the ideal item for pilgrims walking the Camino De Santiago. The Guide to the Camino Francés is designed for both the seasoned hiker or those just starting out. This 168 page Guidebook has been designed to fit conveniently in your pack. A 'must have' for the Camino De Santiago. We accept paypment via PayPal (VISA and Mastercard). Cost includes postage within Australia. For customers outside Australia, please contact us for postage charges to your country. This excludes digital products such as our eBook which have no national or international delivery charges. Items are normally shipped within 3 days of purchase. You will be provided access to download Digital products following your payment. If you don't have a PayPal account, you can expect an additional 2 days for processing.